France is famous for its cheese and Charles de Gaulle had once said that the country that has more than 365 types of cheese is ungovernable. So I decided to make a series of blogs and try to list as many as possible of those “more than 365 types of French cheese”. 2. Pressing: The curds are pressed and drained to varying amounts for different styles of cheese and different secondary agents (molds for blue cheeses, etc.) may be added. This also gives the cheese its shape. Soft cheeses are not pressed. 3. Salting: Salt may or may not be added to the pressed curds. This defines the flavor of the cheese. 4. Aging (Ripening): Finally the cheese is aged in presence of micro-organisms. This is the process that gives the cheese its taste and its texture (hard, semi-hard, semi-soft, soft) which depends on the moisture content of the cheese. 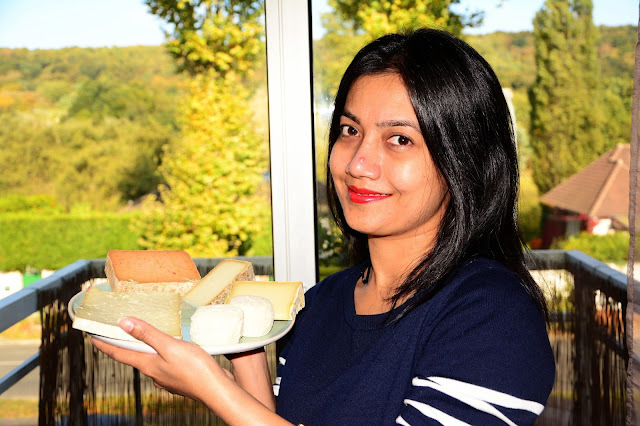 Thus all those “more than 365 types of French cheese” at their roots simply has a permutation or combination of the different options that we have during the cheese making process. 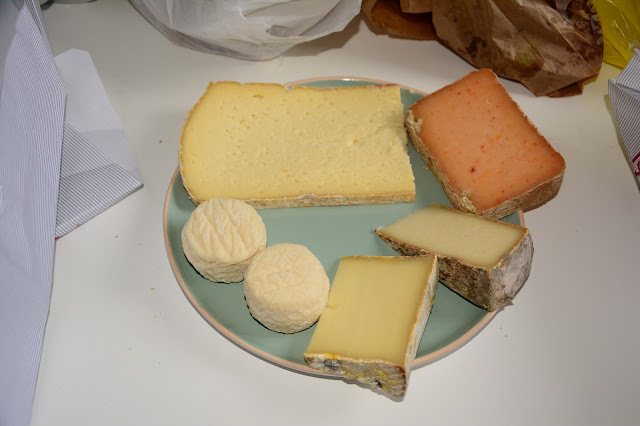 Here are 5 types of cheese that I got from the morning market this weekend. 1.Marotte : This cheese is originally from south-west France mainly from the departments of Aveyron, Lozere and also partially in Hérault. It is a cheese made from full-cream sheep’s milk which is non cooked, pressed and then aged in naturally humid cellars on the edges of the plateau of Larzac for 3 to 12 months. So it can be classed as a Tomme which designates the cheese aged on foothills of mountains. The texture of the cheese is semi-hard (similar to cheddar). So it has a delicate flavor and attains some touches of pineapple flavor when aged for more than 6 months. The main season for the cheese is from April on to December. This cheese goes well with the lesser known wines from the department of Lot in South-West France which are generally a mixture of chardonnay, chenin, muscadelle and sauvignon grapes. The cheese that we got for ourselves this time was from the Lozere department, made from non-pasteurized sheep-milk and had a slight flavor of spring flowers (hope I could convey the flavor to you). This was the first time I tasted Marotte and it is now added to my list of favorite cheeses. 2.Tomme de Rilhac : This is a cheese made from pasteurized cow’s milk, non-cooked, pressed, from the department of Correze in south-west France. The cheese is aged for 1 to 5 months (semi-soft cheese) and has a fat content of 29%. The cheese is aged in mountainous regions and so it is also a Tomme. The fabrication process of the cheese is similar to another famous French cheese, the Cantal which also originates from South West France. The cheese has a slight golden texture and is identifiable by the numerous little holes in it. The cheese has a slight salty taste and conserves the flavors of the natural cellars in which it is aged. 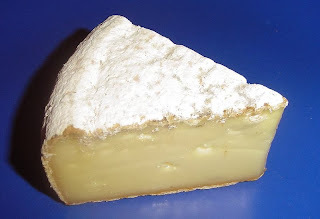 3.Tomme de Savoie : This is a very popular French cheese originating from the Alpine region of Savoie in South-east France bordering Switzerland. The cheese is primarily made from the milk of cows which belong to the Tarentaise cattle. It is from the Alps so it is surely a Tomme. The cheese is classified as non-cooked though it is exposed to a temperature of 30-35° during the pressing. It is a semi-soft cheese which is aged for 1-3 months and is made from skimmed milk, so has a low fat content of around 20%. The cheese is mainly produced from June to October when the bacterial growth in the region is optimal for the rich taste of the cheese. It has a light beige color and a hard grey rind which conserves the smell of the moist cellars where the cheese was aged. The cheese has a nutty flavor and it is one of my favorite cow milk cheeses. For a recipe with this cheese see one of my previous posts. 4.Crottin de Chavignol : France is famous all over the world for its goat milk cheese called the Chèvre (the french word for goat). Crottin de Chavignol is the most famous type of Chèvre. It originates from a small village, Chavignol with a population of just around 200, about 5 km west of the river Loire in central France.The cheese takes its name from the term "crot" which means "hole" in the local Berrichon dialect. The crots designated places located along rivers where the laundry was washed. The clay from these banks was used to make oil lamps and the cheese molds which were in turn used to make this cheese. The cheese is made from non-pasteurized milk. The cheese is subtle with a nutty flavor and depending on the ripening period it starts with a white rind (Chavignol jeune), then takes on a stronger flavor with hardened rind (Chavignol bleuté), and finally a blueish rind with crumbling interior and a slight pungent flavor (Chavignol affine). For a recipe with this cheese see one of my previous posts. 5.Tomme aux piments: Piments in French means chili pepper, and in France we also have cheeses flavored with chilies. 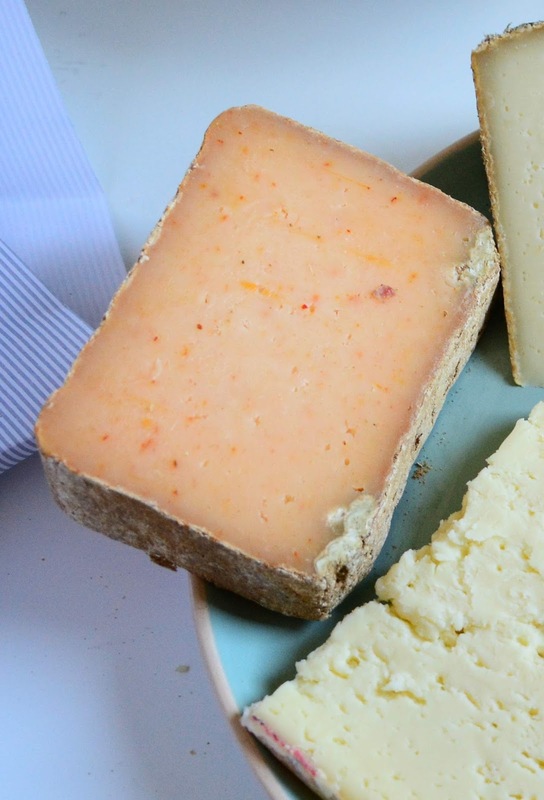 The one we got this week originates from the Alps and is similar to Tomme de Savoie but made with unpasteurized sheep’s milk with sweet chili pepper being added to it before the pressing process. The texture was semi-hard and had a slightly grey rind. 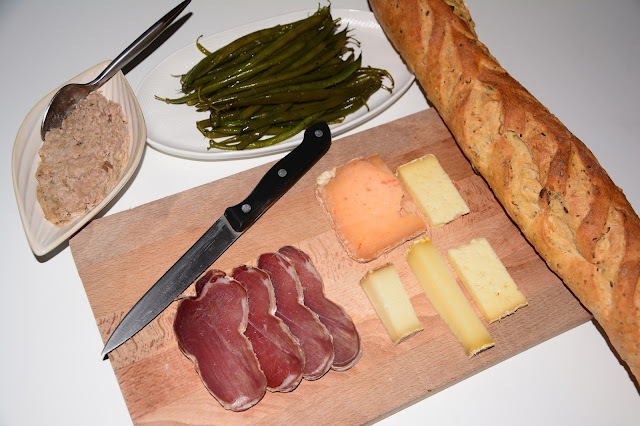 The cheese had a mild flavor of sweet chilies and was really palatable and ideally goes well with red wines from the Loire valley made from Cabernet Franc grapes which has a mild flavor of tannins.